Child-raising years can be hectic...and with four children, I was more than busy. In addition to all that went on with their general care, my husband and I had a business to run; we helped build a house and remodel another. I substitute taught and, for a time, home-schooled my kids. At one point, I had a large garden and orchard and spent hours every summer and fall canning produce. Somehow, I also was a Mary Kay consultant, churned out craft projects, pursued art classes and media writing...taught Sunday school and was active in the church women's groups. In the midst of life...I maintained my love for cooking and baking and even mastered advanced cake decorating. Today, I look back and think, "Who was that person?" People who love to cook, as I do, usually offer to bring a requested favorite dish to group or family events. While it is a big ego boost to show up with a signature creation, sometimes...we just run out of time, energy or enthusiasm for the craft. I remember the day I felt I had mentally hit the culinary wall...I was in the midst of a personal 'soup' war because my efforts in this area were all over the place in consistency, flavor quality and diversity...and I was losing the battle. I shared these thoughts with a more experienced friend of mine; (okay, okay...this is just a politically correct way of saying she was as old as I am now)...anyway, she was also a great cook and she let me in on a little secret..."There is nothing wrong with getting a little help from prepared foods." I couldn't believe she had said that...I had avoided using most prepared food in my quest to cook recipes from 'scratch', and thought every great cook did the same...I decided to take her advice, though and my soups improved...and so did my attitude! Shortly after that, I was asked to provide a dessert for a church dinner. I happily chose a recipe that was very easy to make and... its main ingredient came from a prepared food. I wasn't stressed out...and everyone loved it. Today's recipe is an updated version of that original treat. Heat oven to 375 degrees. In small bowl combine first 3 ingredients. Separate dough into 16 triangles. Roll 5 mini-marshmallows per triangle in margarine, lift out and roll with your fingers in sugar mixture. Place coated marshmallows in center of dough triangle. Sprinkle lightly with chopped nuts and place 4 chocolate chips on top of marshmallows. Pull and work the dough so it completely covers the marshmallow mixture; pinch dough shut. Dip the bottom end in remaining margarine. Place margarine side down in ungreased large muffin cup. Repeat with remaining triangles. Bake at 375 for 11-12 minutes or until golden. Carefully, remove immediately from muffin cups; cool on wire racks. In small bowl, blend powdered sugar, vanilla and enough water for desired consistency to drizzle. Drizzle over warm rolls. 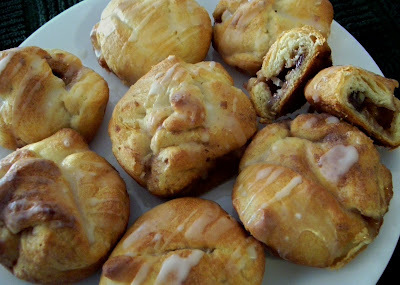 Note: The original recipe came from the Pillsbury Bake Off contest and was the 1969 winner... I have updated the filling to include nuts and chocolate. The marshmallow disappears during the baking process and the chocolate melts slightly; the center becomes a gooey, chocolate-cinnamon-nut delight. By using miniature marshmallows the center mixture stays contained within the baked biscuit dough... a problem with the original recipe. The puffs taste better the day they are made…but, if there are a few people in the house, they will probably be gobbled up in the first hour!